Speculation: Did Aaron Hernandez Kill Himself to Make Sure His Daughter Was Taken Care Of? It didn’t take long for rumors and speculation to start circulating about why Aaron Hernandez may have committed suicide. The former New England Patriots star and convicted murderer was found dead in his prison cell Wednesday after having apparently hanged himself less than a week after being acquitted of a separate double murder charge in Boston. Although his attorney has launched an investigation into his death, believing that Hernandez may have been killed by either fellow inmates or prison officials, people on social media think perhaps Hernandez made one last game-winning play. Under Massachusetts law, because Hernandez died while in the process of appealing his 2014 conviction of the murder of Odin Lloyd, that conviction has been essentially voided. Hernandez was still in the process of appealing his 2014 conviction of murdering Odin Lloyd, which means a legal principle dating back to English common law called “abatement ab initio” applies to his case. “Ab initio” translates to “from the beginning” and chief legal counsel to the Massachusetts Bar Association Michael Healy told the Boston Globe that the principle reverts a case to its start if the convicted party dies before the appeals process has concluded. Healy said that civil proceedings in other cases involving the death of the convicted party were complicated because evidence established in the criminal trial cannot be used to make the civil case. That means that Odin Lloyd’s family would not be able to use evidence from the criminal trial in a lawsuit against the Hernandez estate for civil damages. But what about the money from his contract with the Patriots? A meme that began circulating on social media Thursday suggested that Hernandez killed himself so that his daughter could get the remainder of the $15 million that the Patriots owed him after severing his contract in 2013. The theory is that the abatement ab initio principle would also apply to his contract and the money remaining under it. But the likely answer is simple: No, he is not. Even without a conviction on the books, Hernandez almost certainly was in breach of his contract. And it’s a moot point, anyway. NFL Players Association records show that the Patriots and Hernandez settled a grievance that Hernandez filed in 2014. The settlement gave the Patriots a salary cap credit of $1.184 million, indicating a Patriots win. Additionally, according to Joel Corry—an attorney, salary cap expert, and former NFL agent—grievance settlements almost always tie up all loose ends. However, Hernandez will be able to draw an NFL pension. Article 53.6 of the CBA states that for players who began their careers before 2012, only three credited seasons are necessary to be vested in the league’s retirement plan (now it’s five years). Hernandez played three seasons before his arrest, so he will be eligible for the minimum pension payments. It is unclear whom Hernandez named as his beneficiary in case of death. 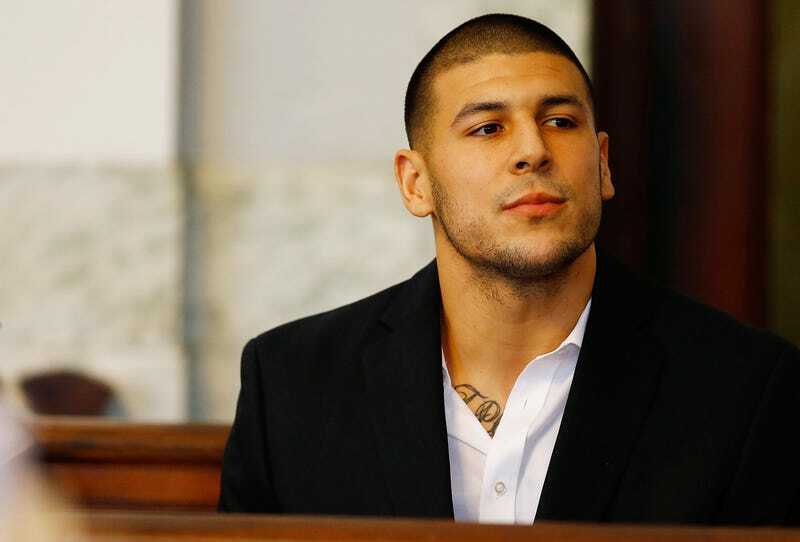 Speculation holds that if Hernandez’s conviction were vacated it would posthumously restore his standing with the NFL, thereby entitling his next of kin to the wealth he would have accumulated if he had never been convicted. But that speculation presumes that since the legal doctrine triggered by Hernandez’s suicide could vacate his conviction, the NFL would somehow be bound by that outcome to pay out the contract’s promises to his family. However, the NFL is a business entity and not a court of law, and Hernandez’s contract was voided 90 minutes after his arrest based on “conduct unbecoming,” not on his conviction. The only person who can tell us definitively why Hernandez may have taken his own life is no longer walking the earth. It’s uncertain whether his daughter would be able to collect any money from his voided contract, but unlikely. It appears her only likely recompense will be his NFL pension, if she is named as the beneficiary. The abatement law may protect his estate from being used for criminal evidence in a civil action by the family of his victim, but it in no way guarantees a windfall for his daughter and family.